The Department of Physical Therapy demonstrates innovation, leadership, and an international presence in the development and impact of the profession as a collaborator and contributor to the health and quality of life in all people. Engage in community and university activities representative of our teaching, research and professional functions. Physiotherapy is an essential health service directed towards helping all members of society attain and maintain health, maximize mobility and function and improve quality of life. Physical therapists collaborate with clients to provide quality client-centred services. “Through evidence-informed practice, physiotherapists prevent, assess, and treat the impact that injury, pain, disease and/or disorders have on clients’ movement, function and health status. Physiotherapists practice both independently and as part of inter-professional teams along the health system continuum from primary to tertiary care,”1. The evolving role of Physical Therapy requires that the physical therapist must be a reflective practitioner, constantly re-evaluating all aspects of practice. 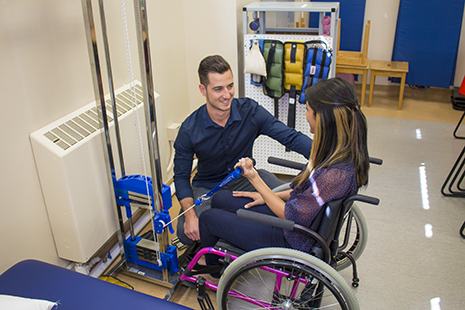 The Department of Physical Therapy in the College of Rehabilitation Sciences has as its primary purpose the preparation of entry-level physiotherapists who are capable of meeting the continuously changing demands of the health care environment. The entry to practice curriculum encompasses instruction in foundational knowledge and skills, clinical practice, professional interaction and a context of practice. This preparation develops students for a challenging and vibrant profession whose growth has been promoted through scientific inquiry. Students are expected to develop clinical reasoning and critical decision making skills through their participation in learning. Interactive learning is promoted through the use of multiple learning opportunities including but not limited to, tutorial sessions, clinical skills labs, peer and instructor coaching, and self-guided learning. Learning opportunities also include formative evaluation where continual feedback enables students to revise their clinical skills and knowledge. The program encourages reflection and lifelong learning to sustain professional competency. Program graduates are entry to practice professionals with competencies that support safe and effective physiotherapy practice. The essential competencies include being an expert in function and mobility, communicator, health advocate, collaborator, manager, scholarly practitioner and professional within health care. These roles support the obligation of the physiotherapists to the community, the members of the health team and the profession.